Remember the "Happy Jack" Hummer commercial with the soapbox H2 that doesn't stand a chance against speedier competition till the kid driver goes off-road to win the race? Well, someone built a crappy replica and it's for sale on EBay. It's almost like rule 34 of the internet, if a marketing hobo imagines a clever thing, someone, somewhere will replicate it in real life. 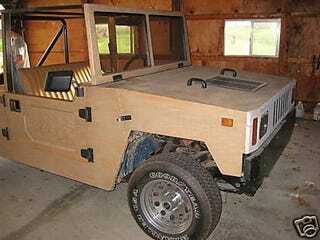 Such is the case here with the Happy Jack Hummer, or, as the builder/owner would like for it to be know as, the "Dummer", it's built on 90's-era Chevy S10 chassis and uses all the finest in plywood veneer's to attain that popular Hummer look. But be careful potential buyer, this creation comes with some pitfalls, such as the infamous "ran when parked" status, which could mean anything from mint condition to rat-eaten wiring with petrified bearing grease, good luck with that. It's supposedly an "off-road vehicle," but it's more like a parade vehicle for your goofy old neighbor down the street.